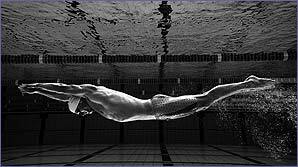 It has often been said that the best way for swimmers to optimise their performance is to swim naked. And until the middle of 19th century, that's exactly what most people did! Nowadays of course, that just won't do, but modern swimwear enables its wearers to move through the water just as efficiently. Swimming costumes have been around since the 1800s, but it wasn't until the end of World War II that companies began developing materials designed to increase the swimmer's speed. Wool - far from ideal! At the beginning of the 20th century, most swimming costumes were made of knitted woollen materials - heavy when wet and not exactly a good look! The elite swimmers - including the 1924 British Olympic team - wore outfits made of silk, which was lighter and more comfortable but much more expensive. Rayon - an artificial version of silk - was introduced in the 1930s, but it wasn't until the 1940s that swimwear technology really took off. Whatever they designed, manufacturers had to bear in mind the Amateur Swimming Association's rules regarding taste and decency - many of which are still in place today. The dilemma was clear - how to create a costume that was attractive and comfortable without causing offence? The answer arrived in the 1940s and 50s, with the development of man-made fabrics like nylon. They were light, comfortable and cheap to produce. By the 1960s, swimming was big business and top athletes were getting faster all the time. Realising that every second counts, in 1962 the ASA commissioned a report into the issue of drag. Swimmers and their costumes create a tiny amount of friction as they move through the water, which means they don't swim with 100% efficiency. We're talking fractions of a second here, but that could be the difference between gold and silver for an Olympic swimmer. The big swimwear companies were also on the case. In the 1980's Speedo became the first company to develop nylon/Lycra swimwear. Lycra is a lightweight, flexible material used in all sorts of clothing, and nylon/Lycra garments remain the most popular choice for swimmers today. Speedo's latest innovation - an all-in-one bodysuit designed to mimic the movement of a shark - will be worn by top stars such as Grant Hackett and Michael Phelps in Athens. Of course, modern swimming isn't just about technology. Fashion and marketing play a huge role, as swimwear companies battle to get the biggest stars wearing their gear. It's hard to imagine what they'll think of next - but with swimmers getting faster and fashion ever changing, those clever swimwear companies are bound to think of something!